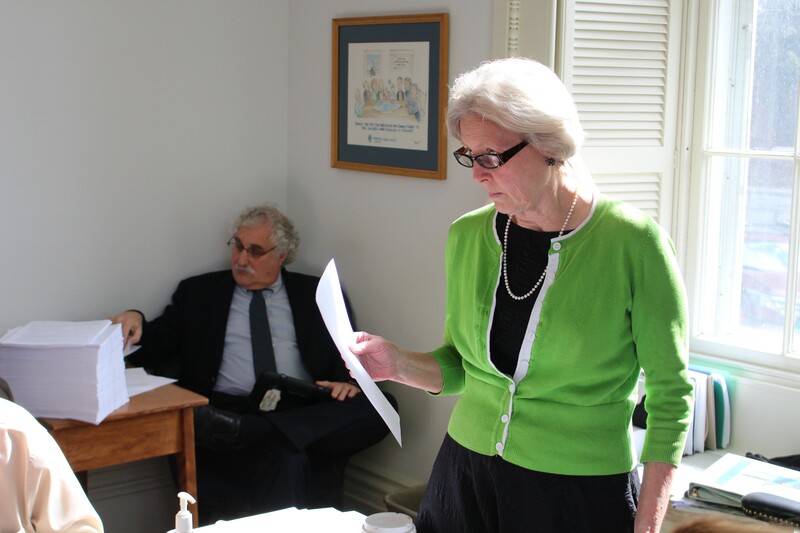 Sen. Jane Kitchel hears from Shumlin administration officials Thursday. Gov. 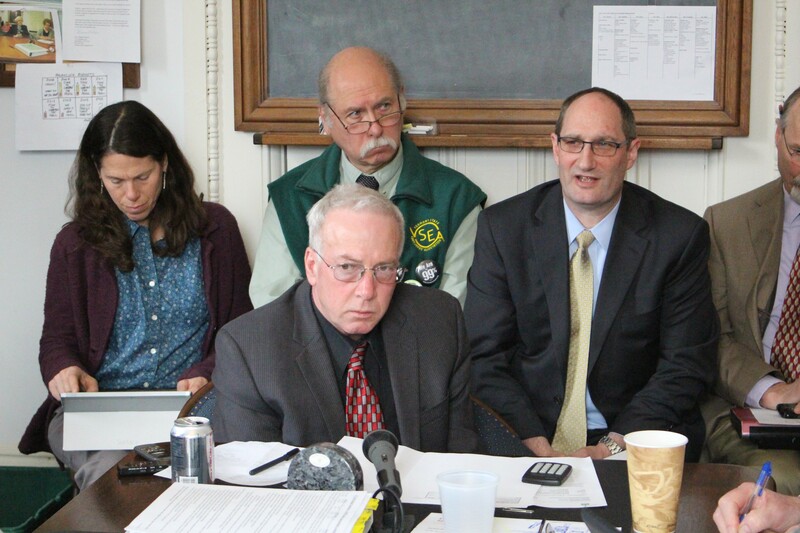 Peter Shumlin’s erstwhile allies in the Democratic legislature lashed out at him Thursday for pushing new cuts after the Senate Appropriations Committee signed off on the budget. “It’s insulting to the process,” complained one top Dem. The Senate had been scheduled to debate its $1.47 billion general fund budget Thursday morning. But late Wednesday, the administration delivered word that it would produce millions more in budget savings ideas. That left some wondering why the governor waited so long. “In the time I’ve been in the legislature, it’s never happened: to come in and say, ‘Oh, we’ve got some suggestions for you,’ after the committee has passed its budget,” said Sen. Jane Kitchel (D-Caledonia), who chairs the Appropriations Committee. Shumlin dispatched Finance Commissioner Jim Reardon and Secretary of Administration Justin Johnson to the committee Thursday morning to deliver a hodgepodge of ideas they said would save roughly $8 million. They suggested cutting another $2.87 million from state workers’ salaries, on top of the $10.8 million already approved. Roughly $2 million would come from weatherization funding, $900,000 from the Brattleboro Retreat and $300,000 from working lands grants. Committee members reacted warily to the ideas, which they complained hadn’t been properly vetted. Finance Commissioner Jim Reardon (center left) and Secretary of Administration Justin Johnson (center right) propose last-minute budget changes Thursday morning in the Senate Appropriations Committee. When the Senate finally took up the budget Thursday afternoon, no members offered amendments to adopt Shumlin’s ideas. Instead, after several hours of discussion and debate, they took a preliminary vote of 23 to 6 in favor of the budget as written. A final vote is scheduled for Friday. Kitchel said late Thursday her committee was likely to approve one idea advanced by the administration: to realize $1.3 million in savings identified by the state’s new Medicaid pharmacy vendor. But she said the other suggestions would have to wait until the House and Senate meet in conference to reconcile differences between their respective budgets. Members of the House, who voted for their own version of the budget in March, sounded particularly peeved about the process. She noted that Shumlin’s own January budget proposal assumed a shortfall of $94 million. After a revenue downgrade the next week upped that figure to $113 million, he declined to say how he’d fill the gap. “The governor never presented a balanced budget,” Copeland Hanzas said. Shumlin initially proposed $112.7 million in new taxes on an annualized basis — including a since-abandoned, 0.7 percent payroll tax — far more than the House approved. “It’s a little perplexing how it is the governor can suggest that the legislature is spending too much and raising too much when his January proposals both spent more and raised more than what the House passed,” Copeland Hanzas said. Johnson, the administration secretary, reacted cooly to the criticism.